As winter draws ever closer and we start to feel the mornings getting colder and the evenings getting darker, cast your mind to your pond and your koi and ask yourself are you ready for winter? What do you need to do to prepare for winter? Are you going to heat this winter and if you do what temperature will you keep your pond at? For those of us that do heat our ponds the temperature that we keep it at varies, majority of us opting to keep the thermostat set at about 8 -10c just warm enough to stop our koi from freezing and getting too cold, but a couple degree’s higher than that and you’re in danger of keeping bacteria thriving but your koi’s immune system at a low and could in turn leave you koi open for bacterial out breaks that they may not be able to fight off. Alternately you could keep temps at 16c plus which would allow your koi to carry on feeding and growing throughout the winter (probably better for a QT tank kept inside and insulated). Do you cover your pond? If so what with? and when do you cover them up? Once again a very individual answer. The weather is very dependent on when you cover up. If your heating at higher Temperatures you may want to cover sooner so to keep the costs down by insulating earlier. Otherwise most of us that do cover tend to cover about the end of October/early November. Me personally I tend to cover using polycarbonate sheets leaving a gap to allow for gasses to escape. These sheets can range in colours from, blue’s, bronze etc. and from previous issue’s I would recommend to stick to the tally clear type to allow as much light (not that we get much during the winter) as possible through to your koi. Remember at times over the winter you may need to lift these covers and clean them to keep the light source to its optimum. There other types of methods of covering you could use including specially designed pool covers, polytunnels, enclosing your pond entirely or indeed even just covering your pond with balls (like the type seen in kids ball pits) but remember to net these in place otherwise you could wake up one blustery morning and find the balls all over your garden. Ok so I have my pond heater set and my covers on, what else do I need to look at? Wow we could be here for some time as there are so many different things that we do, most feed between 10c and 15c Wheat germ and then as the temps drop below 10c stop feeding altogether. The rule of thumb is that if during the winter period on warmer days if your koi are up and actively seeking food you could feed them a small amount but remember to remove what hasn’t been eaten after about 15mins so that it doesn’t sink to the bottom and rot away polluting the pond. Me personally through the months of Dec, Jan, and Feb I won’t feed at all this allowing the koi to use up excess fats built up during the previous summer/autumn period and also to allow the females to absorb any eggs that wasn’t spawned in the outgoing year. Do I need to turn anything off for the winter or insulate or change anything else? Well my personal opinion would be to say don’t turn any air or recirculating pumps off. If you have above water returns into your pond where possible try to make them return under water so as not to add to the chill factor (maybe by re-routing pipework or extending hoses or pipework). 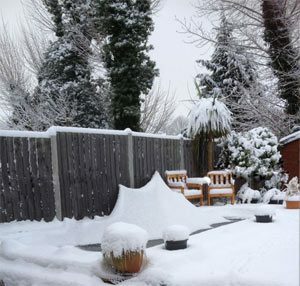 Insulate where possible any pipework where your pond water travels and could cause a chilling effect and if you can insulate your bakki showers/trickle towers where possible (don’t forget to allow enough air to pass in and out somewhere if you can. What I must also stress is that you keep up your filter cleaning and water changes all through the winter. I still continue to change about 1000 gallons of water in my 3000 gallon pond weekly and I continue to do my filter cleaning as usual. At this point could I give you a tip: don’t forget to keep your hosepipe and water purification units in the shed or greenhouse as it’s a pain in the bottom having to try and defrost hoses to do water changes, top ups etc..
Should I treat my pond with anything prior to going into winter? Well I would say that unless you have any issues I wouldn’t add nothing to your pond except good water, however I would suggest that if you can, scrape a few of your koi to make sure you have no little critters hanging about as you go into winter. For those of you with unheated ponds you should do that as soon as possible as most treatments need to be administered above 55f or 12.8c and we won’t have many more days where your ponds will be at that temp. Right so have my temperature’s sorted out, I know what covers I want and when to do it, I’ve set all my returns back into the pond below surface levels, I’m happy with my cleaning and feeding regimes and fingers crossed my koi are happy and healthy going into the winter season.